At this world and age, it is important to deliver differentiated service. As the world is moving to digital platforms, this is getting quite difficult. After all, tailoring an in-store experience to a given customer is easy via human interaction. But, what do you do when different people visit your site? Simple. You deliver an experience based on who they are and their history with your company. Ipstack comes in handy for this. This software is equipped with geolocation API. It connects IP to location API. By simply using the IP of the visitor, it allows you to keep tabs on who they are. This, in turn, translates to a chance of tailoring your user experience. There are different modules delivered by Ipstack. Each one of them succeeds in satisfying the masses. Site customization Is key to a thriving business. Ipstack understands this need and satisfies with via its location module. By making sure of localized data, the software is able to apply geographic restrictions to your site and optimize it accordingly. Therefore, the ads that your visitors will see will all be within reach to them. Such localization and customization aids in building the credibility of your business. Just having a website template and language that suits your visitor is not enough. Instead, you must provide them with a holistic package. For instance, if your visitors are based in America, there is no point in showing them the prices in pounds. But, this does happen in a lot of sites. This might send the wrong message across. This is why the currency module of Ipstack is an excellent feature. It uses geolocation API to give you information about what currency is used by your visitor. Therefore, you can make sure that you display the correct mode of pricing to them. If you add a form to your site to detect the time zone of your visitors, it might be counterproductive. Some customers are not fully aware of their time zones. Others might not appreciate filling out a form in a world where such things are easy to detect. Ipstack takes care of this issue as well. It links the time zone of the IP to location API. All the features of Ipstack, including three of the best discussed, all aid in delivering a user-friendly experience. The fact that it offers six packages means that Ipstack is accessible by all. You can get the basic functions for free and the premium ones for different prices based on your need. This means you only need to invest as much as you need. Ipstack has been successful in being a convenient and helpful tool for all online businesses out there. 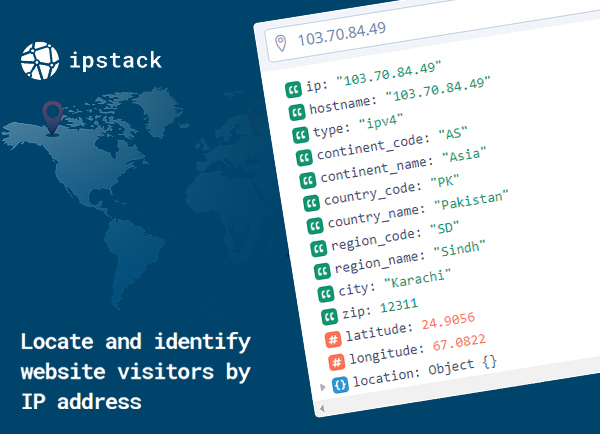 If you wish to tailor your website in a way that converts visitors into customers, give Ipstack a try. You won’t be disappointed by its performance.